Half term is booooring. At least that’s the message I got yesterday. Thankfully it was delivered with a solution: make a video about making pancakes, “Just like Jamie Oliver does Mama. And he always eats the food at the end.” I can’t argue with reasoning like that so we broke out the pancakes a day early to make you a video. We created three fillings for your enjoyment and when I say your enjoyment I really mean theirs. Is there anything better than being allowed to eat excesses of sugar as an actual main meal? I don’t think so. 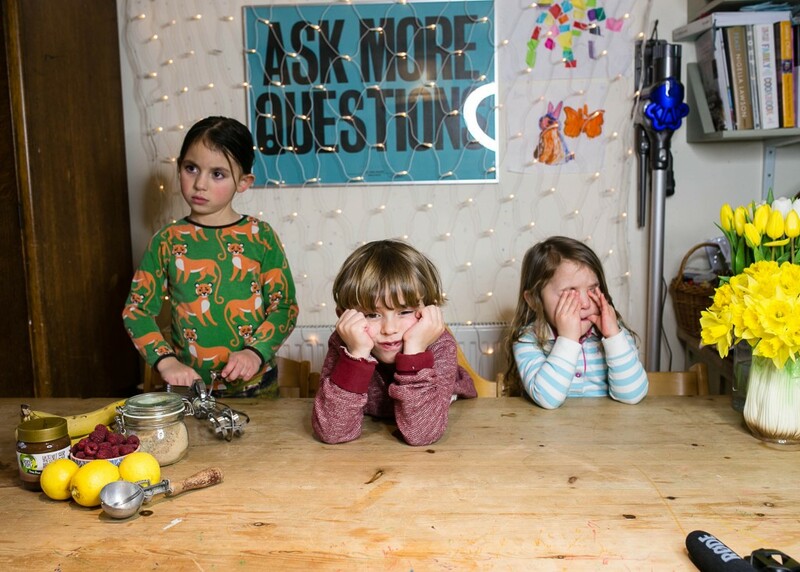 Milla, Monty and Betsy really love making videos and they wonder if they should make more. If you (and your children) would like to see more silliness on video please give them a thumbs up. I’m considering giving them their own YouTube channel so it would really help me to know if people want to see more. Mix the ingredients together in a bowl until you have a smooth paint-like batter. Heat a small knob of butter in a pan (a pancake pan if you have one or a frying pan if you don’t). When the pan is hot and the butter starts to sizzle ladle in enough batter to cover the base of the pan. Cook for a moment and when the batter begins to firm run a spatula around the edge of the pancake. When the bottom of the pancake has lightly browned, flip it over and cook the other side for a minute further. Here are the three toppings we used in the video. My personal favourite is lemon and sugar which if gussied up by using cinnamon sugar. Sprinkle the sugar over the bananas and roll them around until they are coated. Heat a frying pan over a medium heat and add the butter. Pour in the bananas and stir as they sizzle in the butter. When they are a caramel brown turn them over and cook the other side being careful not to burn the sugar. Allow them to cool for a minute or two (especially if serving to children) and then spread on your pancake with the ice cream and nuts. 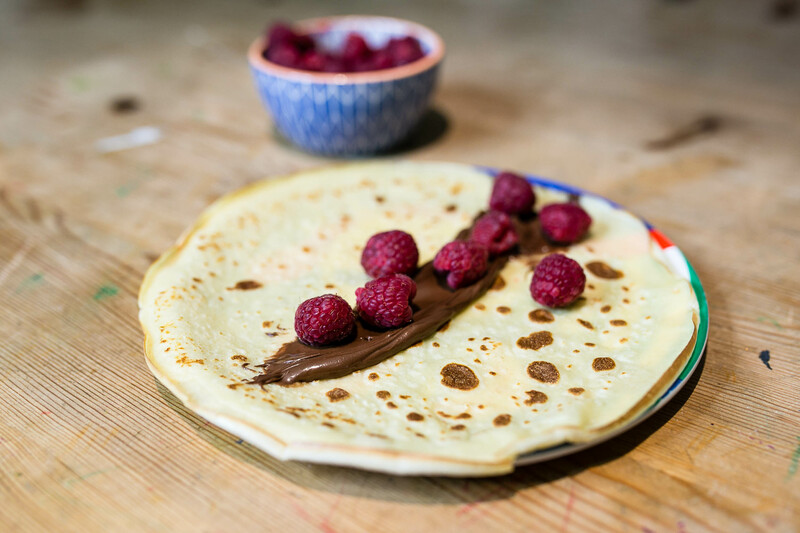 Slather the pancake in chocolate spread. 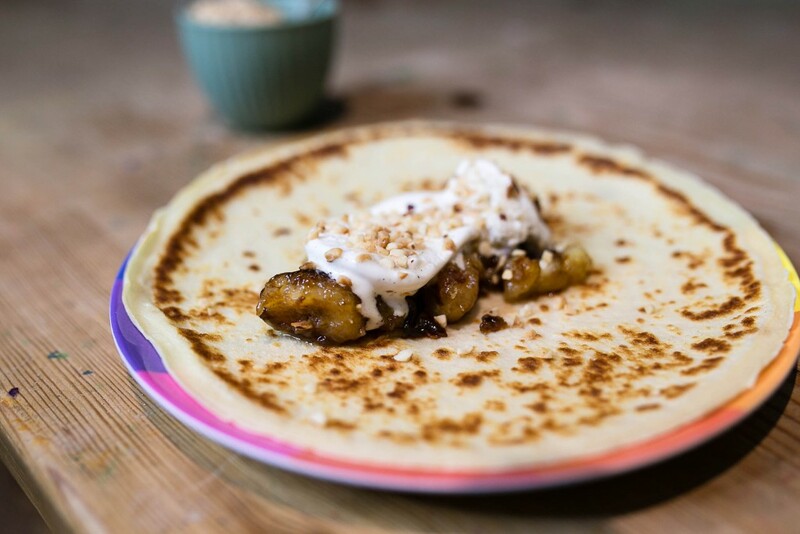 Roll the pancake and congratulate yourself on being a delicious genius. Sprinkle the cinnamon sugar over the pancake. Squeeze lemon onto the sugar and roll your pancake up. Milla, Monty and Betsy you guys are brilliant! We would LOVE to see more of your videos! Oh my! What cuties, so lovely and such delicious looking pancakes too. I think you’ve got some future Blue Peter presenters on your hands there. Cutest blog post ever! That was wonderful. You made me smile for hours. More “how to” videos please!